Ibn Ishaq: Jared married Barakna bt. al-Darmasil b. Mehujael b. Enoch b. Cain b. Adam when he was 162 years old. She bore him Enoch b. Jared. Enoch is Idris the prophet. He was the first of Adam's children to be given prophecy and the first to write with a pen. Jared lived 800 years after the birth of Enoch, and had more sons and daughters. So all of the years lived by Jared were 962, then he died. Tabari: Some of the Jews say that Enoch, that is Idris, was born to Jared. God made him a prophet after 622 years of Adam's life had passed. Thirty scriptures were revealed to him. He was the first to write after Adam, to exert himself in the path of God, to cut and sew clothes, and the first to enslave some of Cain's descendants. He inherited from his father Jared that which his forefathers had bequeathed upon him, and had bequeathed to one another. All of this he did during the lifetime of Adam. Ibn Kathir: As for Idris, God praised him and attributed to him prophethood and truthfulness. He is Enoch. He is in the genealogical chain of the Prophet Muhammad, except according to one genealogist. He was the first descendant of Adam to whom prophethood was given after Adam and Seth. Ibn Ishaq says he was the first who wrote with the pen. There was a span of 380 years between him and the life of Adam. Many of the scholars allege that he was the first to speak about this, and they call him Thrice-great Hermes [Hermes al-Haramisah]. They say many lies about him just as they lied about other prophets, scholars, sages, and people who did things first. Ibn Kathir: "First scriptures" means the scriptures which were revealed to Adam's son "Gift of God" [Seth] and Idris. Ibn Kathir: As for the word of God "we took him up to a high place" Idris was taken up to heaven. Mujahid says that Idris was taken up and did not die, just like Jesus was taken up. Ibn Abbas and Dahhak say that Idris was taken up into the sixth heaven and died there. Hasan al-Basri says Idris was taken into Paradise. 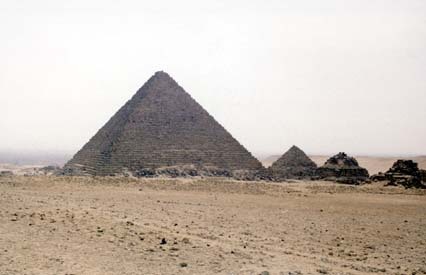 Muslim and Christian sources report that some people believe Idris and Seth to have been buried in the two largest pyramids on the Giza plateau near Cairo. It is also said that Sabaians from Harran made pilgrimage to Giza and offered sacrifices there because they believed the pyramids were the tombs of these two prophets.